We were here on a family holiday 3 years ago and went back it was just as we remembered and more food superb, atmosphere friendly (they remembered us and where we were stayed) . Couldn't ask for more. Extensive menu. Great value. Had 2 X 3 course meals and 2 drinks each for £53. Good specials board too. Roasts, game pie, lamb shanks, steaks, burgers, lasagne, usual pub food plus extensive veggie menu. Really friendly. Definitely going back! Happened upon this pub whilst travelling to Yarmouth. The lunchtime menu was incredible value, £5.45 for 2 courses. Soup starter then gammon with a delicious cheesy potato and salad. Friendly place, very clean, food was really tasty. This cosy pub is the local for family. It was very good value and the food was very tasty and filling. The back room, while not so cosy as the main par too the pub has a glass covered well you can look down into. Kids and adults enjoyed their meals and the pizza was huge! The Bell Inn is a typical village inn, we have visted the Bell lots of times and never been disappointed,we go with family and friends who all say that you get really good food food at reasonable prices, all the staff are very friendly and greet you with a smile. Paul & Lydia welcome you to the Bell Inn, Cawston. We pride ourselves on fantastic, quality food at an excellent price with a warm and friendly atmosphere and wonderful service. To accompany our homemade food, all our meats come from a local, award winning butcher and our wines from a local merchant. We have lots to offer here. Please enjoy our menu, take a look at our Wine List and wander up to our large Beer Garden. We also have Bed and Breakfast rooms if you wish to stay. All food from our menu is available to take away and we can also cater for large parties too. We hope you enjoy your time with us! Cawston was a thriving centre of the woollen industry during the Middle Ages, and was known for its worsted cloth and flannel. In the 18th century the area gained a reputation of a different sort – as a centre for smuggling. Perhaps the smugglers stopped in for pint at the Bell Inn, built in 1673 (the date is carved on a beam in the bar). 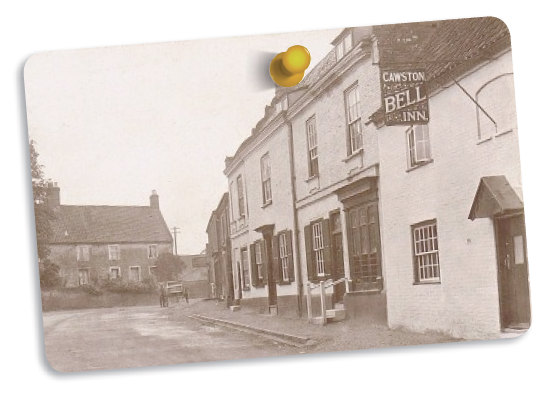 The date must refer to a time before The Bell became a pub, for the first known licensee comes from 1830.